Nurses are at the center of effective healthcare communication and require technologies to support this. Healthcare facilities are often stuck with legacy technology like pagers, DETC phones and wearable badges, that don’t provide the level of communication nurses need. 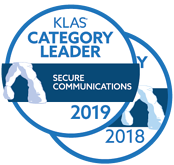 Telmediq is the 2019 & 2018 KLAS Category Leader for Secure Communications Platforms and we have helped thousands of nurses spend less time on non-clinical tasks, and more time with patients. Download this guide to empower nurses and provide them more time with patients. Complete the form to receive the guide. — Selected commentary collected about Telmediq by KLAS Aug 2018, visit klasresearch.com for a complete view.